Today I continued my exploration of the Wellness center. Again I found some positives and not so positives. On the negative side, I am disappointed they don’t have many good places to do pull ups. The two options are an awkward power tower split bar set up and a Smith Machine. Neither option is great. I don’t know why more gyms, outside of Crossfit style venues, don’t have a simple good old fashioned pull up bar. I also had a surprisingly hard time finding a place to do dragon flags. I wound up having to use a cable machine handle wedged into the corner of the frame of one of the cable machines. Even with the 295 pound weight stack, the machine slid a little bit from the torque created when doing the movement. I took my first shot at the VMX endless rope machine. Since I consider myself to have above average pulling strength I put the resistance to the max level of 7 and started pulling down in a hand over hand manner. At first it didn’t feel all that difficult. Look at me, burning through the rope at max level! Well it didn’t take long for the discomfort to set in followed shortly thereafter by plain old pain. My scalpula and back were burning. I pushed to hit the 200 feet of rope climbed mark which only took 1:11 to reach. I followed up with three more shorter 100 foot pulls to give me 500 for the workout. I am looking forward to see how I can progress on the machine. 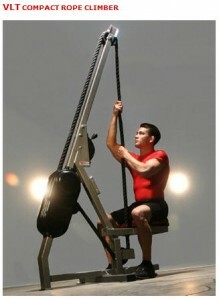 It should be a great way to enhance my pulling strength and endurance.